A wonderful, hand-painted and highly detailed model of the amoured dinosaur Stegosaurus. A hand-painted, museum quality model of the armoured dinosaur Stegosaurus. 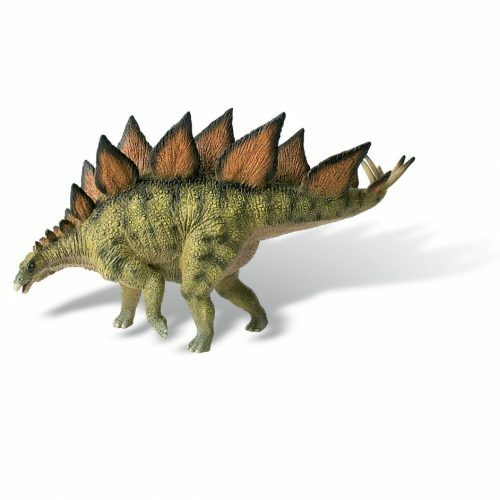 A superb model of a Stegosaurus from Papo of France, great for creative play. Very good Stegosaurus replica, Stegosaurus is one of my fav dinosaurs and the Papo figure really looks awesome, I have a 2013 version and the mouth looks a bit different from the picture (my replica have a “open mouth”). The overall sculpt very is good. The skin is scaly, but not as beautiful as other Papo scaly models. Its colors are nothing exciting. Paintwork is not good this time. The nails in the feet are completely unpainted. The spikes on the tail are unpainted but with only a few white stain lines. Honestly, the figure looks much better in catalogue pictures than in real life. The conclusion: A nice stegosaurus figure but is not painted properly, and its colors are boring. I was really impressed with your range of dinosaurs and the pricing of them. I will definitely be using Everything Dinosaur again.